Make your Whitsunday escape complete with outstanding accommodation on Hamilton Island. Perfectly situated on the edge of the Great Barrier Reef, amongst the Whitsunday Islands, Hamilton Island offers an experience like no other. With glorious weather, clear blue waters, brilliant beaches, fine restaurants, pool bar and plenty of other activities. Hamilton Island also welcomes the new Hamilton Island Golf Club, the architectural wonder that is the multipurpose Hamilton Island Yacht Club and a host of new or refurbished hotels and resorts that set the standard for Great Barrier Reef accommodation. 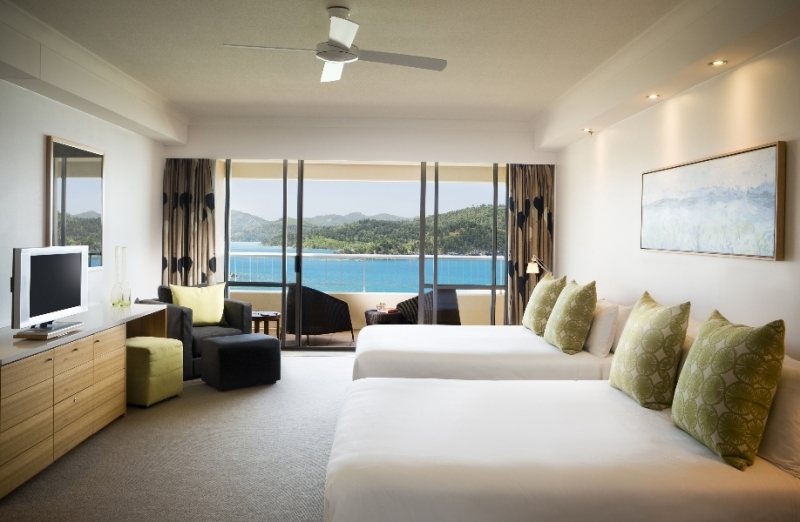 The Reef View Hotel, located at the heart of Hamilton Island, offers a range of four-star rooms and suites. The Reef View Hotel has many amenities, including a 35-metre swimming pool, the Reef Lounge bar, and in-house Pool Terrace Restaurant serving buffet breakfast, light lunches and a la carte dinner menu. Reef View Hotel guests have complimentary use of non-motorized water sports and the hotel has a tours and activities desk, lobby shop and fully serviced Business Centre. All rooms are spacious and well appointed, with a furnished balcony, internet access and bathroom with separate bath and shower. Garden View rooms have leafy views and ocean glimpses, while each Coral Sea View room has spectacular views over Catseye Bay and nearby Whitsunday Island. These rooms are are framed by the cool green palms of Hamilton Islands tropical gardens. Garden View Rooms cost a little less but that doesnt mean they lack amenities, features or comfort. On floors 1 to 4 of the Reef View Hamilton Island, the views are leafy and some rooms offer Coral Sea glimpses. Theres plenty of space to relax in a generously proportioned Garden View room. The Reef View Hotels Garden View rooms have two queen size beds and the modern decor features muted relaxing tones. Each Garden View room has a bathroom with separate bath and shower, and a private balcony with patio seating for sunset drinks from the mini bar. The flat screen TV has pay-to-view movies, internet access is available and each room has individually controlled air conditioning and a ceiling fan. Gazing over the Coral Sea on floors 5 to 18 of the Reef View Hotel, these rooms have the best views on Hamilton Island! Its true - your first glimpse of the tropical Whitsunday Islands and stunning blue sea from your balcony will take your breath away. Every Coral Sea View room has guaranteed Whitsunday views.The Reef View Coral Sea rooms are extremely well appointed and decorated in soothing natural tones. Each room has a private balcony furnished with outdoor lounges for lying back and taking in Hamilton Islands spectacular sunsets. Wake up to an unimpeded view of the Coral Sea from your king-size bed, or twin room with a pair of spacious queen-size beds (please indicate if you have a preferred bedding configuration in the comments field at the time of booking) The roomy bathroom has a bath and separate shower, and Coral Sea rooms can also be booked as interconnecting accommodation, perfect for families or groups holidaying together. Coral Sea View rooms are air conditioned with internet access, a mini bar stocked with snacks and drinks and pay to view first run movies available on the flat screen TV. Buffet breakfast can be added at time of booking for additional $27 pp per day. You will need to make own way to and from Shute Harbour or Port of Airlie ferry terminals for ferry over to Hamilton Island Marina. Please make sure there 20 mins before ferry departure. Minimum 4 nights stay for bookings incorporating the night on 31 December. Rates quoted above are per room per night based on twin share, extra person rates apply and subject to availability. Blackout periods may apply. Kids Stay and Eat Free program: Kids 0 to 12 years stay free when sharing with parents and using existing bedding. Kids 0 to 12 years eat free when dining with parents at selected restaurant and choosing from the special kids menu. Please be aware operators pass on credit card merchant fees so there is a non-refundable 2.5% surcharge for VISA and MASTERCARD card purchases. Any cancellation outside 21 days will incur a fee which is 50% of the amount, and all cancellations inside 21 days will forfeit full amount. Your credit card details will be passed on to the accommodation to secure your booking. Any cancellations within 14 days will forfeit full amount. We strongly recommend that you have travel insurance.